Lion dance | performed to bring luck and to ward off evil spirits. The Guangzhou-style Lion Dance belongs to the Southern style, which could be dated back to the late Ming Dynasty (1368-1644A.D.). The S. Lion Dance is said to be coming from Kung Fu in the martial art clubs. During the mid-Qing Dynasty (1741-1851A.D. 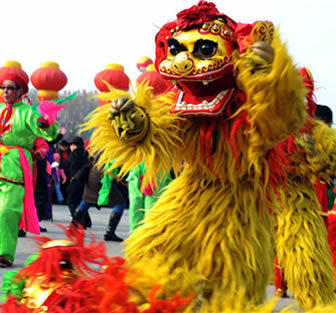 ), Lion Dance became popular in some cerebration activities in south China's Guangdong and Guangxi Provinces. Guangzhou's San Yuan Li Lion and Pan Tang Lion were well-known at that time. In the 16th year of Emperor Guangxu in Qing Dynasty (1890), there was a stone lion with round eyes, a big mouth, a high forehead and nose, sharp teeth, strong limbs in the Chen Clay Academy. Different from nowadays' unicorn Lion, it has no horn in the past. According to the folklore, there was a monster in early Ming Dynasty doing harm to people in Guangdong's Foshan City. Later, people had an idea of making a paper lion with a single horn on his head, playing the drum, gong, cymbal and letting off firecrackers to scare away the monster. From then on, lion with single horn becomes the mascot to against evil spirit. Folk S.Lion Dance was so popular that it can be divided into many different schools. Conflicts between schools of lion dance often occurred in the past. A fighting lion was called Zhang Fei (a military general in ancient times) Lion since then. The Guangzhou-style Lion distinguish from each other on their head designs. The color and pattern of forehead, face, cheek and tongue are different. They have different patterns like knife, rotation, Ruyi (everything goes well) and so on with different names of Liu Bei (Cantonese: Lau Pei; Literary-type) Lion, the Guan Gong (Cantonese: Kwan Kung; Military-type) Lion, the Zhang Fei (Cantonese: Chang Fei) Lion.